Delkevic have been active in the manufacture and supply of motorcycle parts and accessories since 2003, growing the brand awareness by offering quality, affordable products and dedication to outstanding customer service. Our wide range of motorcycle silencer kits have developed a strong following throughout the motorcycle community, offering fitments for many brand models. We also offer an extensive range of stainless steel exhaust downpipes and exhaust collector boxes, which means we now offer complete exhaust systems. To view many other Delkevic products available for this bike model. To view other applications for this silencer. Delkevic silencers are handcrafted from the highest quality materials to enhance your motorcycle in both performance and looks. We guarantee to improve your riding experience at an unbeatable price. Delkevic 350mm Oval Carbon Fibre Silencers are made from a pre-formed carbon fibre composite sleeve and high grade 304 Stainless Steel. These Delkevic silencers provide a lighter, more durable, higher performance exhaust than factory standard systems and come with a removable baffle producing a superior, deep, throaty sound. 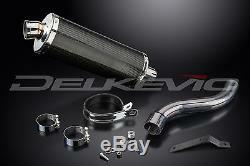 This set includes - Delkevic silencer with a removable baffle, link pipe, clamps, and strap. The weight of the silencer is 1.620 kg. All Delkevic silencers have a 12-Month Guarantee. No rejetting or remapping is required after fitment however we always recommend a dyno test after fitting replacement parts to your motorcycle. For more information on DELKEVIC products. Delkevic LTD Swift House, A34 Liverpool Road Newcastle-under-Lyme Staffordshire, UK ST5 9JJ. We cannot send to a PO Box address. The item "Carbon Fibre Stubby Oval 350mm Silencer Exhaust Daytona 955i Hi-Level 01-02" is in sale since Wednesday, March 08, 2017. This item is in the category "Vehicle Parts & Accessories\Motorcycle Parts\Exhausts & Exhaust Systems\Slip-On Exhausts & Silencers". The seller is "delkevicuk" and is located in Stoke 0n Trent, England. This item can be shipped to all countries in Europe.